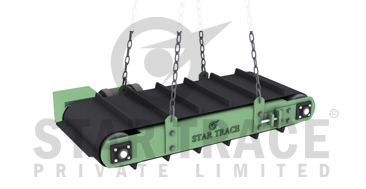 STAR TRACE's Cross Belt Magnetic Separator has been developed to handle high volume product stream flows that exceed the limitations of standard permanent suspended magnets. These models are available in both, manual on/off or automatic, self cleaning system designs. Electrical Power Supplies to operate the magnets are also available and recommended to ensure proper electrical power is supplied to the magnet. Permanent Magnetic Over band Separators are made with powerful Strontium Ferrite magnets and supplied for deep depth up to 300mm.